More information about all types of import filters can be found on the Banana Apps page. In order to import transactions from an Income & Expenses accounting file into a double-entry accounting file, it is necessary that the categories of the Income & Expenses file correspond to the accounts of the Double-entry accounting file. Apart from importing the transactions, an import summary per month or quarter can also be obtained. See the specific page Import Cash book transactions. In order to import transactions from a Double-entry accounting file into another Double-entry accounting file, it is necessary that the accounts correspond. This format must be used by those who want to export data from another software and import them into Banana Accounting. See also the technical information on how to create an import file for Banana Accounting. in order to import data from another cashbook management software (for example a restaurants or a hotel). Allows you to transform data exported by another program (proprietary format), in the import format required by Banana Accounting. Banana allows for import from several other formats. Please take a look at the updated list of Banana Import Apps. It is possible to create one's own scripts that uncode the data contained in one's own files, more info here. After having elaborated the rows to be imported, the program displays a dialog, in which the user can indicate further options. This option is present when data of the bank account (or postal account) statement, or an account's income & expense transactions in a text format, are being imported. Insert the bank account number of the chart of accounts, related to the imported statement. Insert the start and end dates of the period related to the transfer of the transactions. The period can also be selected automatically in the boxes under the dates area. If activated, this function allows the user to not import already entered transactions, in order to avoid recording transactions twice. This option can only be activated when the column "ExternalRef" is present in the transactions that are going to be imported. If not, this option will be deactivated. The option is only necessary for accounting with VAT/Sales tax and multi-currency. If activated, it allows the automatic completion of values that are missing in the imported data (for example, the exchange rate in the exchange rate table). This option is present when data of the bank account (or postal account) statement, or an account's income & expense transactions in a text format, are being imported. This is the document number assigned to the first imported transaction. In this case, the rows of the same invoice are being grouped in such a way that there is only one transaction for the same account and the same VAT code. Please check the explanation Import invoice data. When VAT codes are being applied, there may be rounding differences of just a few cents. In this case, Banana creates an additional transaction for every invoice into which this difference can be recorded. Of course, it is necessary to pay attention that the data to be imported obtain a balance between debit and credit. If not, the transaction row will contain the difference between debit and credit. The program creates some transactions and adds them to the Transactons table. Transactions can be edited or deleted. 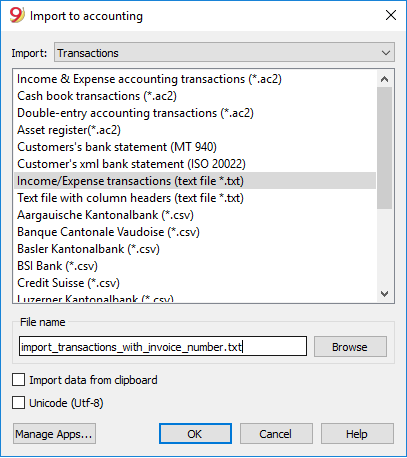 In a double-entry accounting file, the program adds some symbols in the Debit/Account and Credit/Accounts columns, where in an income and expenses file, the program adds them in the Account and Category columns. Symbols should be replaced with the appropriate account or category. This symbol is indicated when no account has been indicated in the dialog. You need to replace the [A] with the appropriate bank account. When ths symbol appears, you need to replace it with the appropriate contra-account, so that the Credit transactions will be balanced with the Debit transactions. In rows with only one contra-account, you will find both the [A] and the [CA] symbols in the same row. In rows with multiple contra-accounts, each row will have its own [CA] symbol. Without the [CA] symbol, it would be impossible to understand if the transactions is a Debit or Credit one. Click on "Manage apps...", followed by "Update apps" and enable the filter for the desired format. This format is no longer supported. Please contact the Postfinance and ask to receive the statements in ISO 20022 format. This error message is being displayed when the ISO 20022 file doesn't contain a bank statement. The ISO 20022 format is a generic format that can contain different types of information, like the bank statement and the payment confirmations In Banana Accounting, only the bank statements can be imported (camt.052/053/054). It is possible to create apps for formats that have not yet been implemented. We have also paid support available for the implementation of customized formats. When executing a payment in the e-banking (for example in the Raiffeisen bank), you need to choose the option 'individual order' instead of the 'collective order' Only by doing so you will be then be able to import the payments as individual orders.